Thin enough to wear inside your shirt, yet roomy enough to hold your phone, credit cards, money & passport. This unique RFID-blocking lanyard wallet uses technology that makes it ultra-secure. If you've ever juggled a passport, ID, boarding pass and your luggage while traveling (and haven't we all?! ), then you know the frustration that frequently happens when you're on the move. Staying organized can help, and that means having all your documentation at the ready. 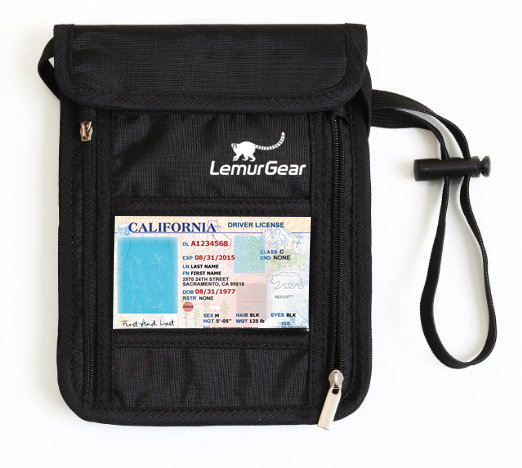 The Lemur Gear roomy passport wallet keeps everything you need right at your fingertips, with 3 zippered pockets to safely hold your travel documents, cell phone and other necessities. Even more important, though, is the advanced RFID-blocking technology that can help prevent the theft of your credit card numbers - and the ruining of a great vacation. Simply organize your valuables for easy retrieval, then tuck the wallet inside your shirt, where it will be virtually undetectable. It's so lightweight and comfortable, you'll hardly know it's there, and you'll be confident in the knowledge that your personal data is secure. • Adjustable lanyard for a customizable fit. • RFID-blocking material prevents data theft. • Lightweight, water-resistant nylon protects against spills. • Holds multiple passports, money, phone, credit card & more. • Wear around your neck or cross-body style. • Clear front window lets you view ID, passport & more without removal. Want to eliminate some frustration and worry when you travel? Buy an RFID-blocking lanyard passport wallet today and pick up a few extra for all the travelers on your gift list. Cassandra's Review- Compact and well made. You can easily fit a small phone, some money and a few coupons inside, maybe even a comb and of course your passport.